A Nod to Nothing: Foiled! It's not like I really want to bike there and that I don't understand there are oceans in the way. 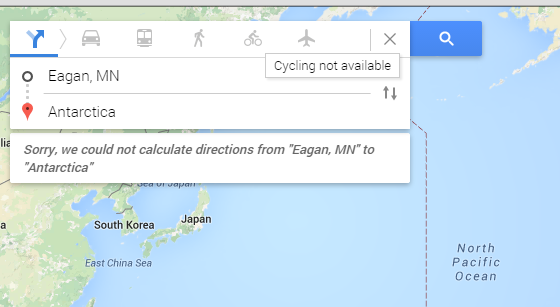 I'm just sort of saying, what if I could bike there, how far would it be? They need to add a pedaled-sleigh option. Maybe I should recommend it as part of Google's Christmas Santa Tracking. I realize Santa's not in Antarctica; he prefers the north pole. But the result is the same no matter which way I point my bicycle.